With every new thrash metal album there springs a hope to resurrect the glory of the said genre. 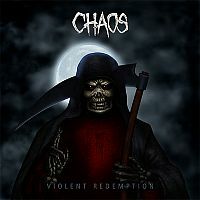 Chaos, a four piece band from Kerala, India have been around since 2005 and through their debut album Violent Redemption they bring out the best of old school thrash metal. With bone crushing riffs and aggressive drumming they have created a power packed album. They are fast and ferocious with unmatched consistency right from the beginning till the very end. There have been a few good bands coming from the Southern part of India and Chaos have certainly made a mark with their debut offering. Right after the intro Ungodly Hour you are exposed to this band’s brilliant musical abilities in the form of Torn and with that a brutally pleasant trip into the good old thrash metal massacre begins. The band has also released a video for their heavyweight Game, and rightfully so to showcase their fierce sound. With tracks like War Crime and Saint you have no choice but to accept the invitation into this band’s very own private hell, the kind which won’t disappoint. Vocalist JK’s mix of powerful and high pitched screams add a perfect kind of fuel to the already musically ignited fire which rages on with every track. The band’s creative diversity and variation is well heard on Heaven’s Gate which combines heavy pounding with a slow and haunted melody. Guitarist Nikhil keeps it tight and is very well supported by Vishnu and Rohith on bass and drums respectively. Their collective energy bursts out mercilessly and keeps building up on tracks like Merchant of Death, Self Deliverance and Cyanide Solution. It’s nothing but pure mayhem till the end as the album finishes with a devastating title track Violent Redemption, completing a power packed debut offering indeed. Most of the songs on this album are short, at an average of 3 minutes except for Heaven’s Gate which is almost six minutes long. However, the short lengths of their tracks don’t at all deter their intentions to slay. They have come up with something which is much needed in the already declining thrash metal scene. A bunch of talented musicians with good and aggressive song writing skills is how I would define Chaos, a pure hell raising machine.